Depending on the taxonomic list considered, there are between 358 and 402 parrot species. This vast count difference is based on whether some subspecies are elevated to species level. This decision is often subjective and lacks the necessary science to justify such a move. For this article, the lower figure is used because it was the number in existence before 1992, when the wild bird trade effectively came to an end in the USA as a result of the Wild Bird Conservation Act; Europe stopped the trade in wild birds permanently in 2007. The US was historically the largest importer of wild birds and consequently this article focuses on the state of US parrot aviculture. This trade drove the world scene, with most new species first reaching the USA and then the rest of the world. The US set trends worldwide and continues to impact aviculture globally. As a result of the significant trade, the American innovative mentality came to praxis. 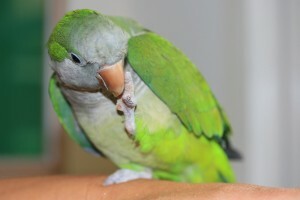 The contributions to aviculture by the US include hand-rearing formulas, surgical and genetic sexing, commercial brooders for housing neonates, most medical techniques, vaccines for deadly pathogens and the impetus to breed neo-tropical and Asian parrots in Europe where traditionally Australian parakeets and parrots were the absolute focus. (Many advances in avian medicine and surgery also came out of Europe in the 1980s and 1990s - Editor) Since 1992, the landscape in the US has changed dramatically, with significant species loss and almost a standstill in the development of new avicultural techniques, equipment and practices. This has been the result of a shrinking avicultural business and the evolution of the hobby moving from breeders to pet ownership. The number of species maintained in US aviculture is identified from a list compiled by Levi Fuentes and reflective of the number of species regarded as valid when the Wild Bird Conservation Act came into force. This list includes 20 species that are critically endangered, 33 species that are endangered, and 53 species that are classified as vulnerable. Many of these forms comprised the 173 species imported in viable numbers into the US. Viable numbers are identified as sufficient numbers of both gender to establish the species in captivity. Of these species, 153 were bred in numbers sufficient to permit them to become established. Many continue to be bred but the numbers fail to be in sufficient to regard them as established. Species in this category include Patagonian Conure Cyanoliseus patagonus, Wagler´s and Finsch's Conures Psittacara wagleri and Psittacara finschi, Yellow-collared Macaws Propyrrhura auricollis, Grey-cheeked Parakeets Brotogeris pyrrhopterus, Dusky Parrots Pionus fuscus, Tucuman Amazon Amazona tucumana, Blue-crowned Amazon Amazona farinosa guatemalae, and Lilacine Amazons Amazona autumnalis lilacina, and Red-vented Cockatoos Cacatua haematuropygia to mention just a few species. The numbers produced in the US are infinitesimal or do not exceed the level of attrition. Because of this, these species can be regarded as biologically extinct in the US. They will follow the path to aviary extinction seen in the Red-bellied Macaw Orthopsittacus manilatus, Yellow-billed Amazon Amazona collaria, Cayman Amazon Amazona leucocephala caymanensis, Mercenary Amazon Amazona mercenaria, and Diademed Amazons Amazona autumnalis, Brazilian Hawk-headed Parrot Deroptyus accipitrinus fuscifrons, Coral-billed and Plum-headed Parrots Pionus sordidus and Pionus tumultuosus, Tui Parakeets Brotogeris sanctithomae, Red-capped Parrots Pionopsitta pileata, Purple-bellied Parrots Triclaria malachitacea, fig parrots of the genera Cyclopsitta and Psittaculirostris, and most species of hanging parrots, to list just a few species. The current trend is for species loss. Fewer and fewer species are maintained in sufficient numbers to ensure their long-term survival. Only species that make suitable pets—the pet trade is the driving force in US aviculture—can be expected to remain viable and have expanding populations. These species include the Blue and Gold Macaw Ara ararauna, Green-cheeked Conure Pyrrhura molinae, Quaker Parakeet Myiopsitta monachus and Sun Conure Aratinga solstitialis. Many critics of breeding fail to understand this situation. This lack of knowledge makes them call for a blanket ban on all breeding. The basis is the supposed glut of unwanted parrots in rescue centres. In most cases, these individuals do not understand the number of species that were once present in aviculture in the US, trends and future prospects. To call for a blanket ban on breeding is to put a nail in the coffin of many species that do not pose a problem for rescue centres. This is especially applicable for species facing a very bleak future in the wild, where habitat loss, mining, petroleum exploration, agriculture and other threats are causing the populations to decline precipitously. Many species common in aviculture and regarded as a problem by the rescue community face this dilemma. On Halmahera in Indonesia mining and deforestation are causing mass destruction to the forest. This combined with trapping for the local (note the word local) trade have caused a population decline so precipitous that in my opinion perhaps fewer than 200 wild Umbrella Cockatoos Cacatua alba survive on this island. The Chattering Lory Lorius garrulus will probably become extinct in the wild in 20 years as a result of deforestation and the intensive demand locally. I have also witnessed the threat on this lory on Obi and Bacan islands. I have no data for Morotai though suspect it is the same or worse given the island´s smaller size. If the species disappears, then so will the three races that inhabit the islands: morotaianus on Morotai, garrulus on Halmahera and flavopalliatus on Obi and Bacan. Incredibly the call for a ban on breeding by many who fail to even grasp the threat to parrots includes these lories. If such a call were followed, three distinct subspecies will follow the Carolina Parakeet Conuropsis carolinensis into extinction. 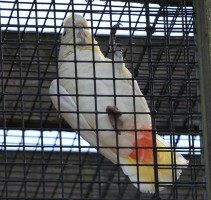 The number of species of unwanted parrots in sanctuaries is typically exaggerated. If we look at all parrot species in rescue centres, that number reaches 57 species. This includes single birds that may be an isolated case. In fact, the “problem” species most commonly encountered in such centres are two cockatoos (Moluccan Cacatua moluccensis and Umbrella Cockatoos Cacatua alba), four macaws (Blue and Gold Ara ararauna, Green-winged Ara chloropterus, Military Ara militaris and Scarlet Macaws Ara macao or their hybrids), primarily three species of Amazon parrots (often Double Yellow-headed Amazona oratrix, Yellow-naped Amazona auropalliata, and Blue-fronted Amazona aestiva), a few conure species (especially Sun Aratinga solstitialis, Nanday Aratinga nenday and the ubiquitous Green-cheeked Pyrrhura molinae), the Quaker Parakeet Myiopsitta monachus and African grey parrots Psittacus erithacus. 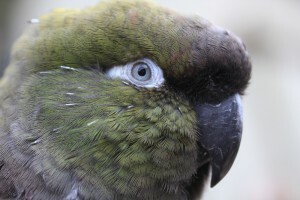 Of these species, three (Moluccan Cockatoo, Yellow-naped Amazon and African Greys) have captive populations that are declining, with the level of new recruits being less than the level of natural attrition. 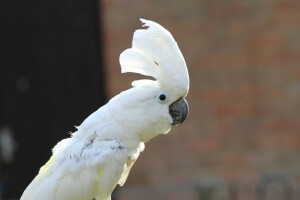 This trend suggests that the Moluccan Cockatoo will become extremely rare in US aviculture in 20 years. The African Grey and Yellow-naped Amazon will follow suit. The Yellow-naped is very endangered across its wild range, with some populations in Mesoamerica facing certain extinction in the next decade. The same applies to the Moluccan Cockatoo. One of the species that the ill informed claim should not be bred is the Sun Conure. This species is the focus of a conservation project being sponsored by the Smithsonian Institution. Their researchers have found that the species has an extremely low population level in the wild and that it is highly endangered. Imagine where this species would be in three decades if no more individuals would be captive bred? Many critics of aviculture believe that if parrots were not bred in captivity they would survive in a utopian world, where they could reproduce, flock and thrive for eons in jungles full of butterflies, orchids and bromeliads, all guarded by indigenous communities. Nothing is further from the truth. Wild parrots across the globe are threatened and many species will not survive another century; many have only decades of existence if current trends do not change. Habitat loss is without a doubt the greatest threat. Fly over Indonesia, western Central America, Madagascar or Haiti and you will see barren hills and valleys. No vestiges of the once exuberant forests remain. The next menace is the local trade. 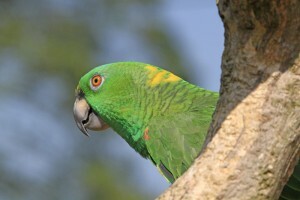 It is easy for groups to point to the international trade, but the USA and Europe have not imported wild parrots since 1992 and 2007, respectively. These individuals also claim that huge numbers of parrots are smuggled across the border into the USA. This argument has no merit. In fact in most instances captive bred birds in the USA are cheaper than they are in their own range countries, where the supply of wild birds is declining as populations ebb. As an example, I recall spending days looking for wild Lesser Sulphur-crested Cockatoos Cacatua sulphurea to study on an Indonesian island. Within hours of finding one, I observed a trapper placing snares in the tree where it had perched. (I later returned and removed the snares.) He could sell the bird for US$1000 in Jakarta, or more than most US breeders would get for a chick. The growing scarcity of this species in the wild, where populations are being ravaged by beak and feather disease, made it a status symbol to own, hence the price. Conservationist groups blame aviculture because it is an easy target and avicultural organisations are not organised to rebut these claims. To lay blame on the second most important threat to wild parrots - trapping for the local trade - is difficult for these organisations, as this would raise the threshold much higher. It would require educating the local populace, enforcing laws that are invariably ignored at a local level and international level and addressing poverty. None of these groups will address the real crisis because it is far better for them to blame aviculture and then gloat at their success, even if imaginary and even in cases where a Band-Aid was placed on a major wound. The populace at large is ignorant and they are gullible enough to accept the claim these groups make as gospel. In the developed world, we have air conditioning and heating, refrigerators, entertainment in the form of television, the internet, and pantries full of food, medical attention when needed and a readily available supply of medication. Our comfort level is very high. This same level is not seen in the habitat of the parrot. In Amazonian Brazil, for example, medical attention, if it reaches the forest, is seen only a few times a year. Pills are often sold one or two at a time because of their cost. We can all afford a bottle of aspirin but a forest person may only have enough funds to buy one or two pills. Some years back I saved a life with a meagre US$50.00 when Pablo Cuache tracked me down in Leticia, Colombia to plead for help. For the cost of some drinks a child who had been bitten by a poisonous snake was saved. The money could buy transport to the hospital, where antivenin could be administered. Without this paltry aid, the child would have died given the lack of even infinitesimal resources of the village. Parrots to these people are seen as food, as a commodity if they can be sold, or as toys for children or entertainment. In Northern Maluku, Chattering Lories are so commonly kept as pets that on the islands of Halmahera, Obi and Bacan, I calculated during visits that four out of 10 homes kept one; they place a ring made from coconut shell around one leg and then keep the bird permanently tethered to a small bamboo perch. A common reason for having them is to keep children occupied or as amusement—a living form of a television as it were. In one village I found an individual dead on the ground still attached to its perch. The owner had crushed it after the bird bit his three year old child. If aviculture obliges the claims to stop breeding birds, this will be one species that will be known to future generations only as museum specimens or in photographs. The individuals that want aviculture to stop breeding parrots because of the alleged over-population live in a bubble that is utopian and is far, far removed from the reality of the jungle. The same situation seen in Indonesia plays itself out elsewhere in the world. José Luis Tella and his team of researchers found that between 1,122,000 and 1,556,000 parrots are trapped each year in Bolivia. Of these, 97% were kept locally as pets; the remaining 3% are sold through the Los Pozos market in Santa Cruz or through other means. The median survival age of the birds is 9 months. Upon the death of the individual, another specimen is acquired, which will meet the same fate and again is simply replaced. In random interviews of 300 homes, they found that 49% of the families had a parrot. During a recent lunch in Seville, Spain, with Tella and his biologists we discussed that he has observed the same situation in Central America and Perú. When asked to describe the state of affairs he used one word: “desperate”. The Tella study also revealed the devastating effect this trade has on the ecosystem, as parrots are now known to be key dispersers of seeds. The disappearance of the parrots means that even in a virgin area the forest will slowly disappear as new recruits to the forest would be significantly reduced. To reverse the current threats of deforestation and local demand means greatly altering living habits and making important sacrifices. I have on several occasions visited the offices of conservationist groups that vehemently lay blame for every declining species on the doorstep of aviculture. The often posh offices have desks made of hardwoods, an extremely comfortable work environment as a result of air conditioning or heating and parking lots full of cars. They fail to realise that the energy consumed to keep their work place comfortable, the hardwood felled to make their desks or floors, and the steel in their vehicle required deforestation, mining and contamination of the environment—all threats to the parrots they claim they want to protect. Not one was prepared to permanently make the necessary sacrifices to their lifestyle to alter the fate of the parrots or the ecosystems they purport to “save”. It is easy to point one finger – but then they forget that three more fingers are pointing back at them. Few of these “enlightened” individuals are prepared to travel to remote areas, where security may be poor, living conditions can be very rough and exotic diseases are common, to try and educate the inhabitants not to trap the birds or even inculcate proper husbandry to diminish the exorbitant attrition. Aviculturists must expose these organisations for being disingenuous. When they plea for support or funds, their claims must be dissected and criticised. Their actions must be subjected to global scrutiny. Living in the western world and requiring the third world and its inhabitants to make changes is easy, but effecting those changes is hard. First alternative means of earning a living must be provided to trappers and bird traders and secondly common needs will need to be met before anyone can demand that the forest people change their habits. The world is not perfect and cannot be seen from a black and white perspective. Because of the current state of affairs, aviculture has two options: 1) Modify current breeding techniques to reduce the handful of species that are often neglected, this by producing birds that are more adapted to living in a home. This requires selling young that truly understand they are birds and not an attachment of their human owner. 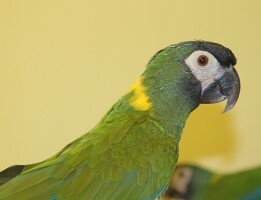 This means that an education campaign needs to be carried out in a broad sense, so that breeders understand their responsibility and then getting the new parrot owner to grasp the responsibilities of pet ownership and the understanding that having an exotic bird in the home will require a serious commitment. In Germany Heiki Mundt does this very successfully. Her customers are required to undertake a course before they buy a bird. Her system should be emulated as it will significantly reduce the number of birds that end up in a second or subsequent home. 2) Aviculture must educate those against breeding so that they understand the threats faced by wild parrots and the need for captive breeding. This also means that rare parrots or species facing a spiraling population decline should only be sold to other breeders. Rare species in rescue centres or foster homes should not be allowed to perish but should be placed with a responsible breeder who must agree to retain the young for breeding stock and not sell them for pets. If not, we will be witnesses to many cases of Martha the passenger pigeon, who died alone in a cage at the Cincinnati Zoo. With Martha´s passing, her species breathed no more—the passenger pigeon became extinct. In addition to the above, everyone interested in parrots needs to support fieldwork, education campaigns at a local and international level, and sanctuaries, and to teach proper sound husbandry to those that lack access to information on how to care for their birds. The money needs to end up in the field or helping communities—not as bonuses, salaries or overhead. It also needs to end up in education campaigns where the funds are spent on the ground and not in international travel, printing colorful brochures for people that may be illiterate, or in giving them trinkets that they may not appreciate. Saving parrots is all of our responsibility and it includes education, conservation and captive breeding.